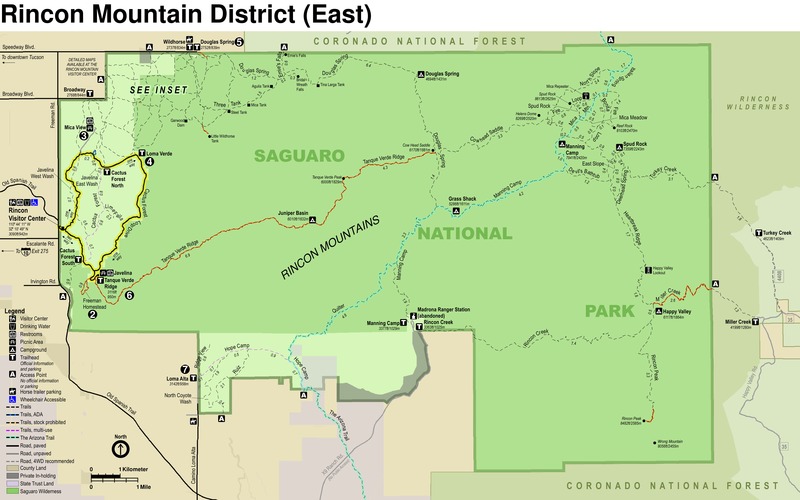 The Javelin Wash along with Monument/Wildhorse Wash and Bajada Wash in Saguaro National Park East are the Three Largest washes that drain the western most portion of Tanque Verde Ridge from Tanque Verde Peak west. Javelina Wash drains the far western portion of the ridge and is by far the longest wash. Two washes feed into Javelina Wash, Javelina Wash East and Javelina Wash West. Both East and West Washes have a trail of their own but are rather short (East at .6 and West at 2.3 miles), so it makes sense to combine these in a loop for a description. 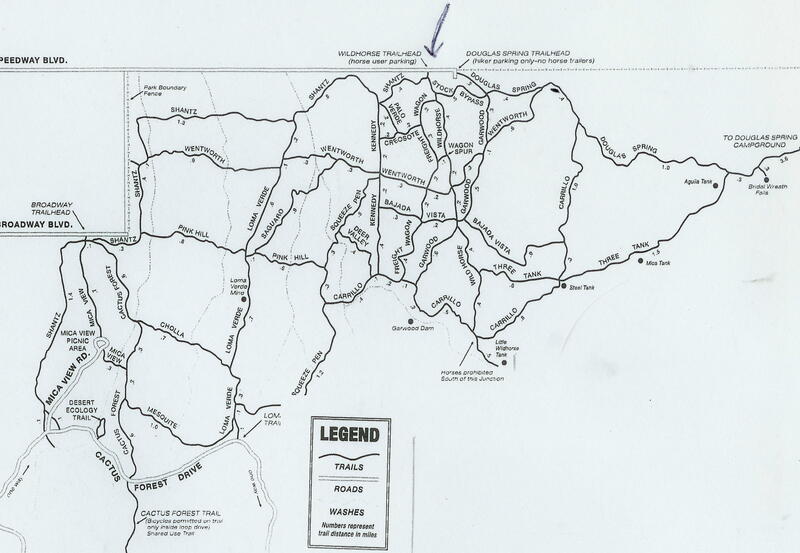 In a clockwise direction, take the Javelina Wash East to the Cactus Forest Trail, head south to Javelina Wash West and continue downstream back to the start point for a total of 4.6 miles. From the Desert Ecology trail head along the Cactus Forest Loop Drive, head south along Javelina Wash. About 100 yards up Javelina Wash is a sign indicating the Javelina Wash East and West Trails. 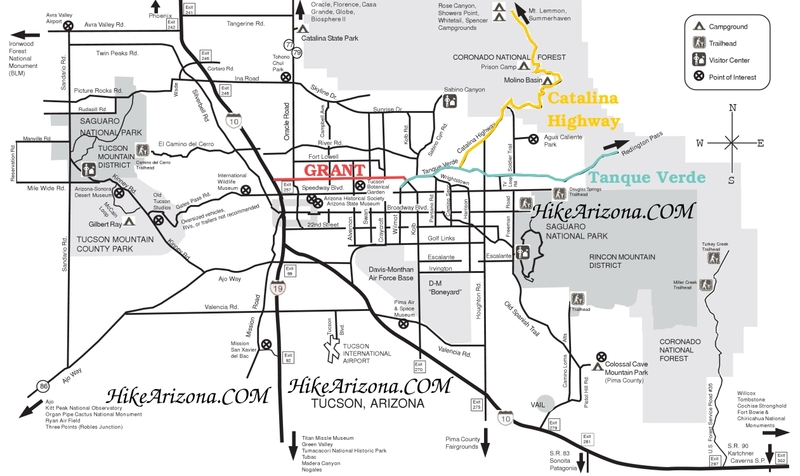 Take the East trail for .6 miles to the junction with the Cactus Forest Trail. This wash is fairly narrow but easy to navigate, no need to crawl through brush. Once on the Cactus Forest Trail head south for 1.5 miles to the signed Javelina Wash West Trail. While on this trail check out the century old Lime Kilns, they are just off the trail a couple of yards. From the Javelina Wash West Trail, head downstream 2.3 miles to the Javelina Wash East Trail to complete the loop. The Javelina Wash West Trail follows along the wash but there are many branches to this wash, stick to the main wash as best you can to avoid narrow overgrown sections. You have to make lots of decisions on this portion of the hike, Is this the main wash or is that. Just remember there are no wrong routes, just that some are more right than others. 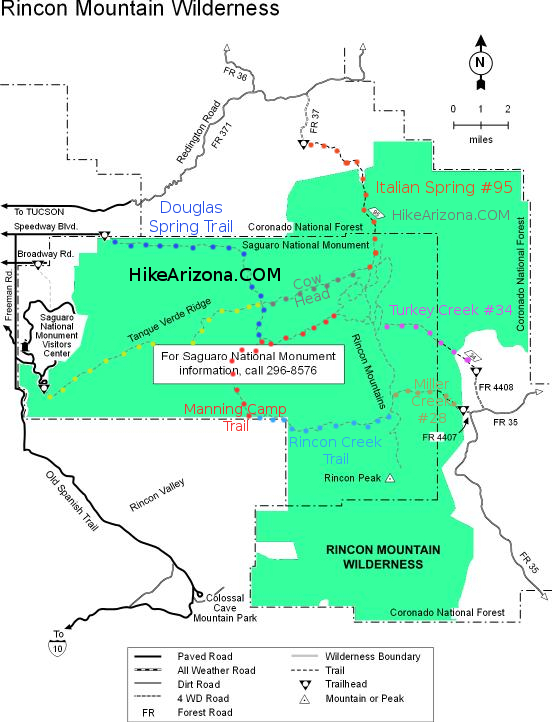 Fun loop hike, best if done after a good rain or monsoon storm that packs the sand making it easier to walk. Each turn in the wash seams to add something new and interesting to see. 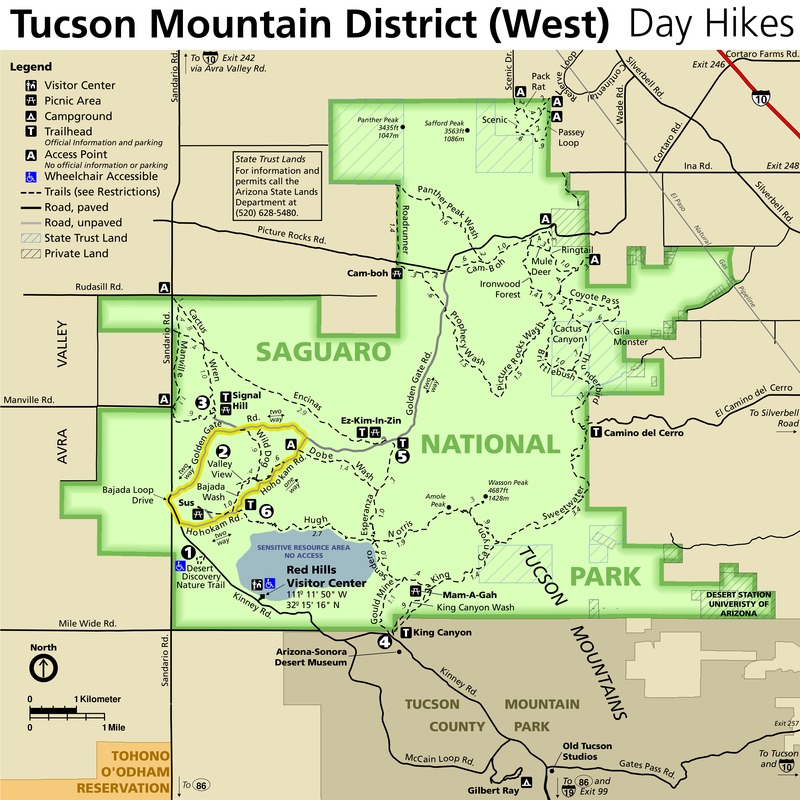 This hike can be combined with other trails to make the hike longer, a good trail to do in conjunction with this one is the Javelina Wash Trail.